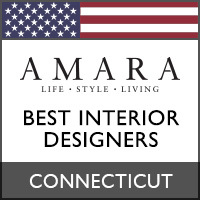 When we call Christina Roughan an interior design rockstar, we don’t just mean she created killer interiors for the Connecticut and New York area. We mean she’s an interior designer, but also used to shred a guitar for audiences across the country in the 90s. As the former rock band singer readied herself for a more long term career commitment, she developed her artistic skills at jobs as part of design teams at Ralph Lauren and Tommy Hilfiger. In 1996, she turned to interior design, where she applied her gift for “bringing down the house” to residences and commercial spaces. Now, Roughan splits her time between Connecticut and New York and owns Roughan Interiors, combining subtle color with antique furnishings to bring her visions to life. Enjoy Christina’s ASPIRE encore in today’s Designer Friday. 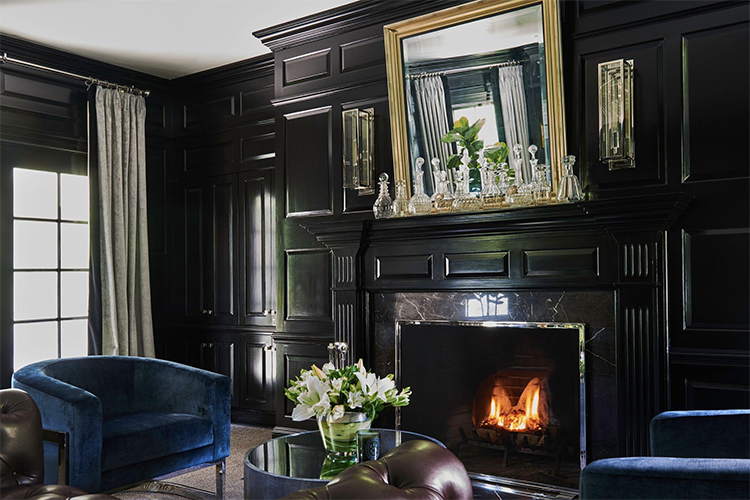 Black walls and a marble fireplace make this sitting room by Roughan a contemplative, moody chamber. 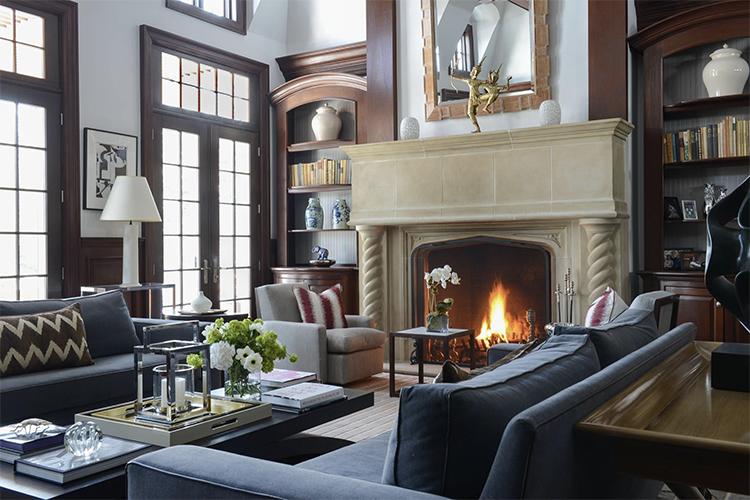 Rich wood accents give this Connecticut home a sense of grandeur and tradition. A striking stone fireplace brings the heat. Christina Roughan – My favorite time of day is early mornings when the world is quiet and I can think. Andrew – What is one thing no one knows about you? Christina – I used to be in a Funk Rock band called Swelter in NYC in the 1990s. I was a singer. We toured everything from the Elbow Room and Alice’s Underground in NYC to Philly, Chicago, Maryland, and Delaware. It came pretty far in 3 years. Andrew – Dream country to work in? Or a dream project to take on. Christina – A large castle in Ireland that could be restored and transformed into a home for a modern family. I have roots there so it would be fun to do the research as well. Ever since I saw the interiors of Hugh Hefner’s plane, I got the bug to do a private plane and then fill it with the most fabulous art. A gallery on the go. Andrew – Vintage or new? Christina – Vintage mid-century, I love pieces with a story. Christina – My children, Hermes Marveilles perfume, and Slim Aarons King of Hollywood original photo. Andrew – What’s one ingredient you put in everything? Christina – Himalayan sea salt. Andrew – Must have clothing item everyone should have? Christina – Black Cashmere turtleneck. It sums up everything I adore about style – clean, sophisticated, no-nonsense and it can go anywhere. Andrew – What’s inspiring you in life (in the industry) right now? Christina – All the wonderful creative work that people are showing on Instagram. 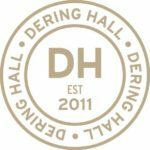 Everything from a small ceramicist in a remote village to fabulous fashion photography to a rare piece of vintage Swedish furniture. The world is your oyster and Instagram gives you a feast to look at. Christina – Well of course NYC. Andrew – Who is your ideal client? 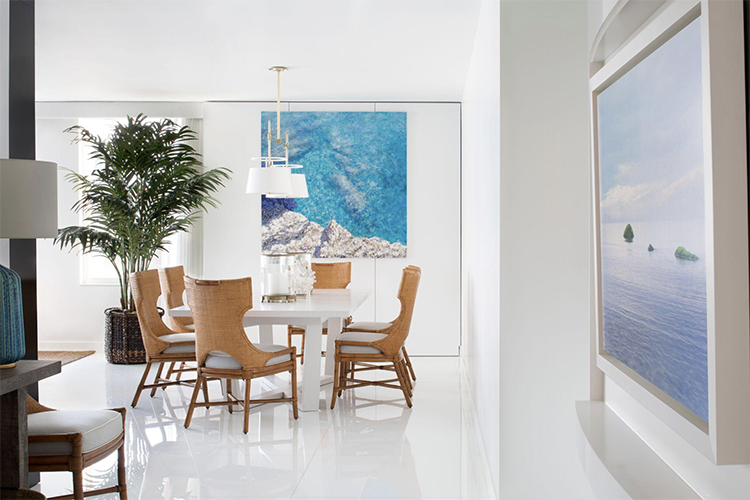 Reflective floors and all-white surroundings give this Roughan-designed home a glossy, futuristic feel. Starting with neutrals and layering in color is a Roughan trademark. Here, she incorporates blues into a clean, white living room. Read the original article at www.aspiremetro.com.